City dwellers, like you and I, travel the world for a bunch of reasons. One of them is, of course, all the pretty sights that make your Instagram account shine. In the coming months, if you are looking to satisfy your wanderlust in Karnataka, we’ve found you some gorgeous palaces, beaches, and natural wonders that your followers will love! It’s a shame that photography is restricted inside the Amba Vilas Palace (popularly known as The Mysore Palace). But if you are looking to show off the spectacular architectural gem on your Insta, then, we recommend a trip on a Sunday evening. On Sunday nights (as well as public holidays and all the days of the Mysore Dussehra), visitors gather on the lawns of the magnificent palace and watch in awe as it lights up. The twinkly outlines of the domes and the elegant arches against the backdrop of the night sky sure makes it a sight to remember. Add serenity to your Insta page with a shot of the towering Gomateshwara Statue in Shravanabelagola. Built all the way back 983 AD, the monolithic statue of Bahubali, a revered figure in Jainism, stands on a hillock and inspires wonder. A calm, blue river lined by trees, on one side, and the deep blue Arabian Sea on the other side, the drive through Maravanthe is a sight for sore eyes. Park your car by the side of the road and pick a spot where you can capture the river and the sea quietly rumbling along without noticing each other. There’s very little in the historic town of Hampi that doesn’t make for great pictures. But one of its most the enduring images is the Vittala Temple complex, where the main temple’s pillars actually sound like musical instruments when struck. For your Insta, we recommend the complex’s magnificent stone chariot, embellished with intricate carvings, that was built in the 16th century. History and architecture lovers can’t get enough of North Karnataka. And the Gol Gumbaz, in Bijapur, is one of its main draws. The mausoleum of Mohammed Adil Shah, Gol Gumbaz has been around since 1656 and features the largest dome in India. If you want to showcase something different about this structure, then, a sunset shot from one its famed minarets comes highly recommended. Since we’ve had a splendid monsoon this year, Jog Falls sure will make for a pretty picture. From your viewpoint on the opposite side, you can get click happy as you watch as the River Sharavathi splits fourways and tumbles down a rocky gorge. Create a splash with a vibrant picture of the colourful Namdroling Monastery that sits right outside Coorg. Home to thousands of Buddhist monks and nuns, the pagoda-style facade of the monastery embellished with miniature prayer wheels and bright red doors is sure to enthrall your followers. Possibly one of the most tranquil spots Karnataka has to offer, the Kabini River sits deep in the jungle. You can take a boat ride on its waters or drive along its banks to capture herds of deer or elephants or even a lone tiger swing by for a drink. Not very far from Bangalore, the Big Banyan Tree has been a popular picnic spot for ages now. Said to be over 400 years old, the massive tree spreads its roots over three acres and makes for a thrilling picture. 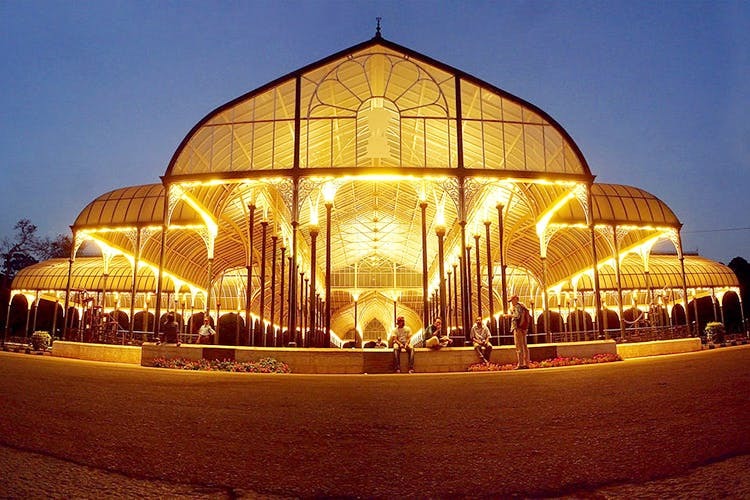 Part of one of Bangalore’s best known tourist attractions, the Glass House at Lalbagh was built in 1889. Marked by elegant arches, the Glass House is especially Insta-friendly during the colourful flower shows that happen during Republic and Independence Day.